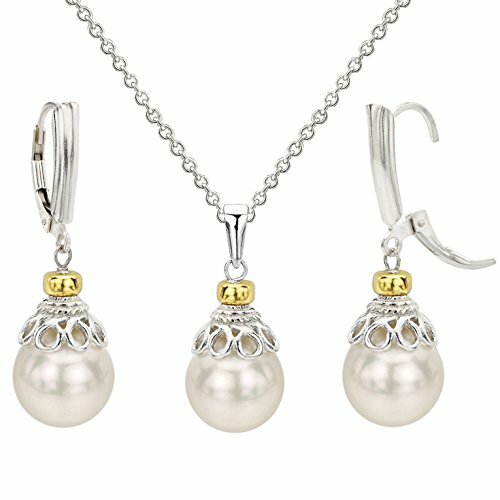 Sterling Silver 10-10.5mm White Freshwater Cultured Pearl Pendant Chain and Lever-back Earrings Set by La Regis Jewelry at SCRHI. Hurry! Limited time offer. Offer valid only while supplies last. This is A Beautiful Sterling Silver 10-10.5mm Cultured High Luster Pearl Pendant Chain Necklace 18'' Length, with a Matching Lever-back Earrings Set. This is A Beautiful Sterling Silver 10-10.5mm Cultured High Luster Pearl Pendant Chain Necklace 18" Length, with a Matching Lever-back Earrings Set. Perfect for Any Occasions. We Carry Different Kind of Pearls. Please Contact Us If You Do not See What You Need. 925-Sterling Silver jewelry set, comes with an 18-inch length necklace that can be worn by everyone. Along with the necklace, you also get earrings set. The earrings compliment the necklace and help you complete the look.